There were many aspects to MSSR as a professional. He was a teacher first and foremost but he also enjoyed a challenge and developed models and software for many business requirements ahead of many other commercial applications. He not only developed, but he also mentored many young professionals, guiding them to build software to suit their needs. One of such professionals—who remained his closest associate is Shri. M.Parthasarthy. Together they were an incredible team. 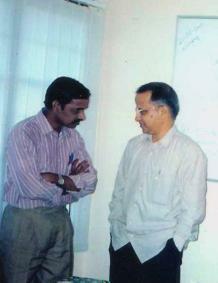 In many seminars, Shri. Parthasarathy would be switching the slides as MSSR lectured. They would work in such synchronicity that there was never a need for MSSR to ask for the slide to be switched. It amazed many people that two people can work that well. Having worked that closely with MSSR, he has been a key person in putting together the information featured here. Being a man who too complete and utter joy in learning new things, he was always on the lookout for exciting new technology and new avenues to implement it. Shri MSSR worked virtually every sector, bringing automation and innovation to many companies—large and small. Starting his own firm in 1980, he was one of the first people in Chennai to bring the power of personal computing to people at what is now the hub of outsourcing for many countries throughout the world.